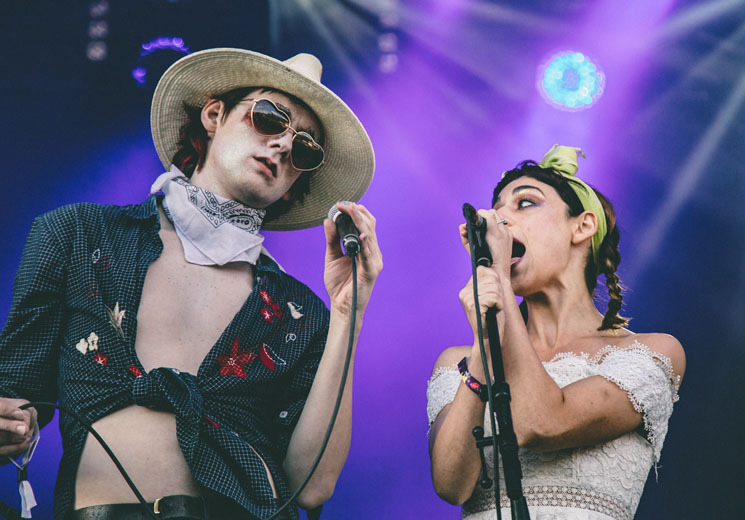 Known as much for their erratic live shows as their music, Foxygen, accompanied by a full brass ensemble, took to the green stage with lead singer Sam France dressed in a button-up shirt tied at the waist and heart-shaped sunglasses with red glitter caked onto his eyes like dried, glistening blood. Launching into a surf rock-inflected, spoken word intro that had France yelling out "you got to reach your hand out to the lord, brothers and sisters," Foxygen moved in to their 2013 hit "San Francisco" to the crowd's pleasure. Touring in promotion of the intentionally campy, big-band LP Hang, France made sure to channel a theatrical bandleader persona; waving his arms about and dancing the lindy hop with their touring female vocalist during "The Garden of Love" and then "Follow the Leader." While Foxygen's accompanying band maintained a professional composure throughout the course of their set, France went full Marilyn Manson-meets-Woody from Toy Story — part fun innocence, part ghoulish theatrics. Moving into "America" with France yelling out "I really, really, love my goddamn country," and ending with the popular "No Destruction," Foxygen brought the laughs and the jaw-drops, but left the crowd confused after a disjointed performance.